All rights reserved. 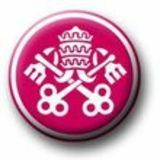 First published 2019 by The Incorporated Catholic Truth Society, 40-46 Harleyford Road London SE11 5AY. 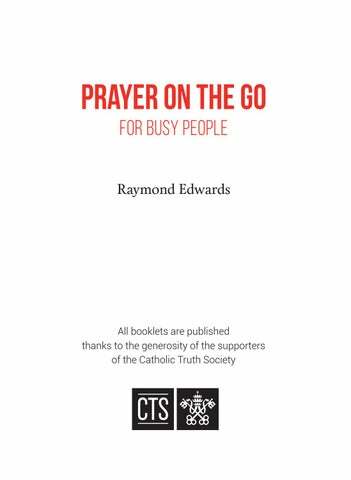 Tel: 020 7640 0042 / Fax: 020 7640 0046. www.ctsbooks.org Copyright © 2019 The Incorporated Catholic Truth Society. O Lord, thou knowest how busy I must be this day. If I forget thee, do not thou forget me. Q Sir Jacob Astley, before the Battle of Edgehill, 23rd October 1642.
blessings that remind them, in all their daily tasks, that God is in all these things, that all comes from his hand as a gift, that he may be praised for small things as much as for great: we bless God for coffee, and for the birth of a child; God sees our joys and answers our needs both small and great. This habit of having words of prayer, known by heart, woven into the daily fabric of our lives, is a profound example of how prayer may be an integral part of even the busiest day. We should say grace before meals, aloud if we can; and we can thank God in silence for a cup of coffee drunk on the run, or a sandwich eaten at a desk. We can say a quick prayer before leaving home, or starting a car journey, or entering a tedious or important meeting or interview. The more we do this, the less we need to think about doing it. It is as automatic for me to say a quick prayer before leaving the house as it is to check I have my keys. My experience is that the busier I am, the more I need to intersperse my day with brief moments of prayer. We ask God to help us â&#x20AC;&#x201C; to give us words, and mercy towards, or patience with, those we meet or talk to; but also to help us welcome the events he sends us, and see his hand and his word in these events. I am not grasping, unjust, adulterous like the rest of mankind, and particularly that I am not like this tax collector here. I fast twice a week; I pay tithes on all I get.” The tax collector stood some distance away, not even daring to raise his eyes to heaven; but he beat his breast and said, “God, be merciful to me, a sinner”. This man, I tell you, went home again at rights with God; the other did not. (Lk 18:10-14) A tax collector, remember, was an outcast, a public sinner, a collaborator with the Roman occupiers; whilst Pharisees were not sanctimonious villains, but sincere and careful observers of the Law of Moses, profuse in good works. But God looks at the heart: to pray, we need honesty, not self-congratulation. We ought to pray in our doubts and difficulties, in fact we should especially pray, even if prayer itself seems a pointless soliloquy, our shouting into the void of an empty and meaningless universe. God, the saints tell us, looks kindly on such prayers. They have a long history: “Our span is seventy years, or eighty for those who are strong; and most of these are emptiness and pain” says the Psalmist (Ps 89:10). Praying is not a technique for regulating our minds and feelings. Sometimes, we pray for something (humility, say, or peace) and then busily try to work up the feeling of it in ourselves by dint of will. This is to get things all wrong. Ask, and God will send us what we pray for, perhaps through an event. Prayer is not selfhypnosis; it is a conversation. We should remember, of course, that praying like this is only one part of the spiritual life of an adult Christian. We should, as we are able, frequent the sacraments, especially the Sunday Eucharist; and we may find other forms of praying helpful, like the Rosary or Eucharistic Adoration. We should pray in the morning and at night, perhaps using the Divine Office or another form of set prayers. A book like the Simple Prayer Book may be very helpful here. We might also think about the long-established spiritual practice of â&#x20AC;&#x153;offering upâ&#x20AC;? : that is, resolving to accept some suffering or inconvenience, great or small, and ask God to use our acceptance to heal the world, or perhaps to ask for some specific favour for ourselves or for another. Most days have their share of inconveniences; even the most trivial can in this way become something very different, and certainly not meaningless.